Another super productive day! And I also got amazing news–I was worried about my anthro exam since I haven’t done essay-based exams in quite a long time as a science major, so I was considering pass/no-passing (grading option) the class if I didn’t get a solid A on the first midterm. The pass-no pass deadline was today too, so that threw in some stress since I didn’t know my grade yet! I feel much more energized and yet peaceful, so I’m getting a lot done without stressing out about it! Like today, I went to class, wrote 2000 words of my novel, went grocery shopping, walked 8 miles, had a 1.5 hour workout, and made raw pumpkin pie for a potluck tomorrow. Crazy good nana ice cream! It was 80 degrees today and although I gave in and wore a skirt and sandals, I decided to pretend it’s actually fall once I got home. 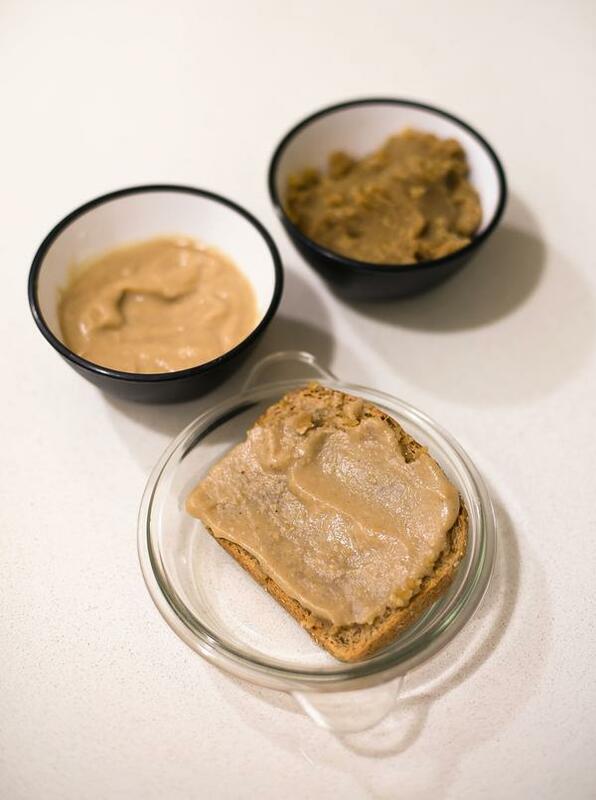 For my first full day of having my Vitamix, I couldn’t resist making apple butter AND walnut butter… then I combined them on toast. And it was pretty much the most amazing thing I’ve ever had. The flavor combination is just perfection, and together they’re so rich, that just a little bit is really satisfying. 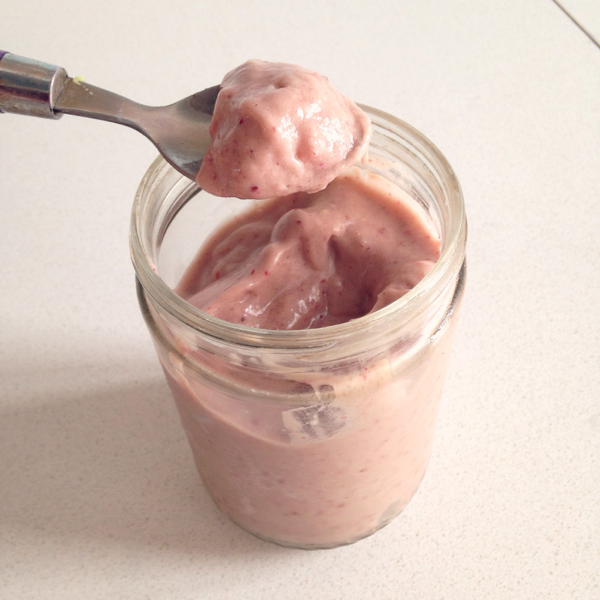 No more paying tons for overpriced $20 raw nut butters–I can make it myself now for $10! And of course I also made a smoothie this morning… have to use the vitamix as much as possible to justify the cost 😛 Plus I can’t resist the option of such healthy raw/fresh food! And I felt good all day long! (Despite that time of the month, in fact.) I waited to eat til noon besides a coffee with almond milk in the morning, and even managed to do well on the calorie count despite going for a chocolate biscotti later while writing at my favorite cafe. Despite such a deficit, I still managed to kill it at the gym and had one of the best workouts ever–1.5 hours of lifting followed by 30 minutes of HIIT because I still had so much energy to get out. I couldn’t even stop moving once I got home, I just wanted to keep going! My Sunwarrior vegan protein also arrived early–lucky day! When I get really excited about something–especially something involving coming up with lots of new recipes–I get very impatient. I can’t wait to start drinking tons of green smoothies! 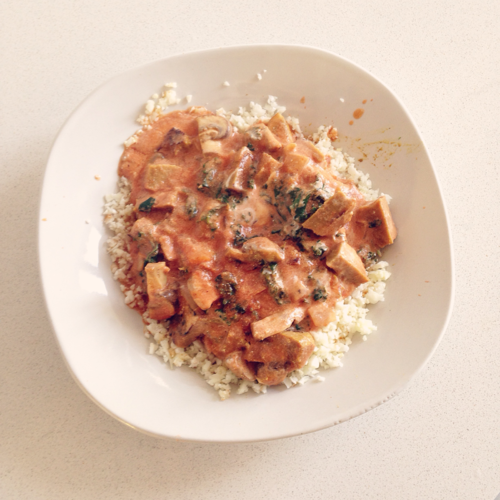 In better news, I tried cooking with seitan for my second time ever, and found it to be a great replacement for paneer/tofu in my usual tikka masala. 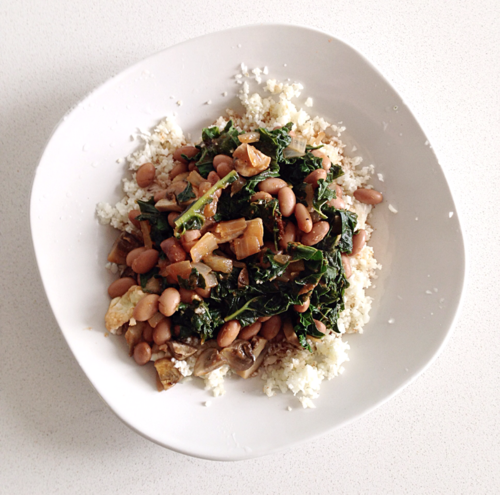 So easy to work with, so protein packed, and so delicious! Had an amazingly productive day! 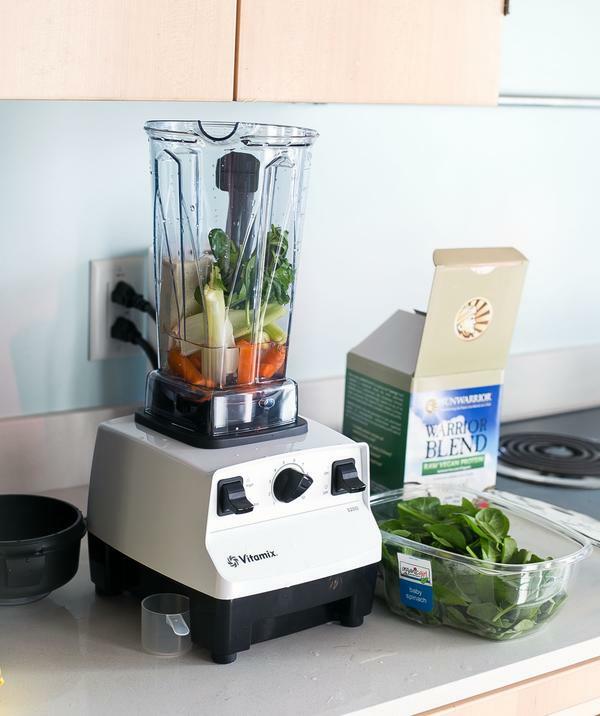 Started and finished my client product shoot (which financed my Vitamix purchase!) in under 2 hours, which is a new record for me. In addition to studying, cleaning, walking and grocery shopping, doing a bit of bodyweight exercise, and baking protein bread for my friend. I’m trying to use up all my non-vegan foods over the next week, so it’ll be a bit of a cheese binge… I’m already getting sick of it. I’m so ready to get back to experimenting with tofu and beans! Based on getting a big order this weekend, I made a big decision: I finally ordered a Vitamix! My vegan friends have been raving about them and telling me to get one for ages, and because my client photoshoot this weekend covers the cost (I love my clients! <3), I finally shelled out for a $330 reconditioned one. It’s amazing they offer such a deal, considering the brand new model is $430–reconditioned ones are just like new but were either lightly used at demonstrations, or returned by someone within the 30 day grace period. A hundred dollars is totally worth the possibility of a scuff or two! Depending on how much I fall in love with it (I have a feeling I’ll be very, very in love with it), I’m considering trying a 30 day juice challenge of sorts by making new green smoothies every day! In less exciting news, I felt easily fatigued and weak today while lifting–I have a feeling it’s the calorie deficit and my rather lackluster food choices this morning. But I still finished my planned routine (at lightning speed, somehow.. perhaps I just wasn’t resting long enough) despite it. Can’t wait to lose the fat and get back into muscle building mode. 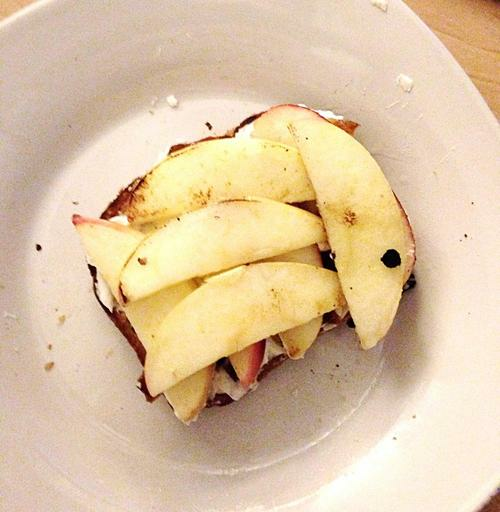 Scrumptious and nutritious 10 minute dinner! I was planning on working out, but I was STILL sore from Wednesday’s workout–I feel much better about how well my routine is targeting my glutes and hamstrings! Not to mention, I ran around all day carrying tripod + camera bag and my shoulders were a bit out of whack. It was an incredibly animal-centered day, and it was wonderful. 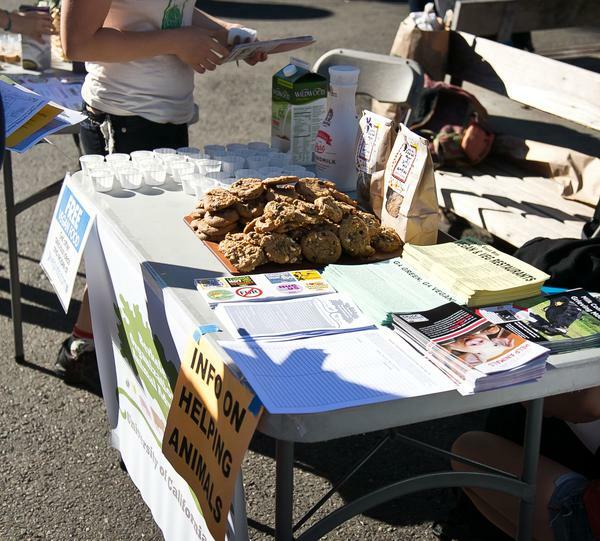 I spent the morning helping hand out vegan samples for my animal club’s table at a food day event on campus, including vegan cookies and almond milk. The brand of almond milk we were giving out as samples was so amazing I had to IMMEDIATELY buy it myself. So I did on the way home! Then I went to my research apprenticeship studying squirrels–being natural happy squirrels in the wild instead of stuck in cages in labs! Our tasks with them vary, and today’s was getting them used to figuring out how to open a box with nuts inside, and finding out if they preferred corn vs. walnuts for use in future tasks. After that I had a meeting for aforementioned club, and I was tasked with taking a group photo. So I spent the entire day walking around with my 20 pound camera gear, taking pictures of the event, the squirrels, and the club!